It’s a Shahs Of Sunset (and former Shahs Of Sunset) engagement bonanza! 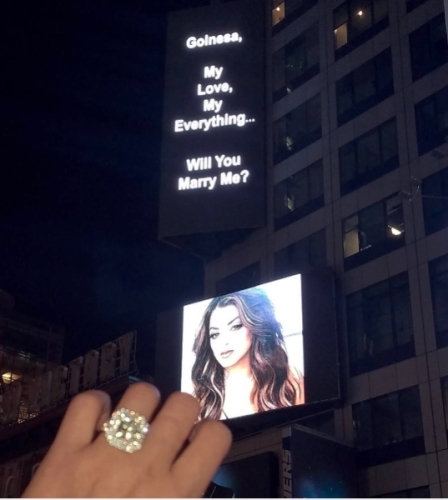 First Lilly Ghalichi said yes, then Golnesa “GG” Gharachedaghi did! GG is currently in NYC performing in an off-Broadway play. Her boyfriend Shalom flew in to surprise her with a Times Square proposal this weekend. 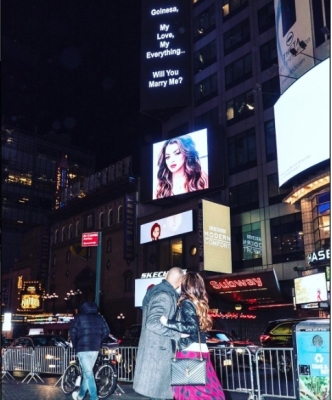 Shalom rented a billboard to pop the question – accompanied by a massive diamond of course! RELATED – GG Feuding With Reza’s Husband? Both GG and Shalom confirmed their engagement on instagram. Photos below. And, Lilly recently revealed that her boyfriend Dara popped the question this August after a whirlwind romance that began in March. And unlike her ex-fiance Dhar Mann, Lilly knows Dara is a keeper and the real-deal! “I would say within two or three months of dating we were inseparable,” Lilly told The Daily Dish. “It all moved very quickly.” Dara owns a successful office chair company which he runs with his parents. Related – Lilly’s Former Fiance Was A User & Famewhore! Photos of Lilly and Dara, plus her ring are below! TELL US – BETTER RING: GG OR LILLY? WHOSE WEDDING WOULD YOU RATHER SEE?